About twenty years ago our family stayed at a bed and breakfast where the owner set the table with a different colored goblet for each person. I loved it! I thought it would be fun to start collecting goblets so I could do the same thing. But over the years, and I kid you not, I never found one. Not one. Anywhere. So I gave up on the idea. Then last spring Doug and I were traveling, and we wandered through an antique store. I was not thinking of goblets at the time, but a lone bright orange goblet was sitting on a table, and I had to pause. It was stunning. I think the sun was shining through it. It’s the one on the bottom shelf on the left. Well I wandered around the antique store a bit to think it over. I remember wondering if it wasn’t a little too late to get started on a collection now. I mean, really, what would I do with one orange goblet even if it was really cool? Then I saw the most vibrant cobalt blue goblet (lower shelf middle), and I took it as guidance. I bought them both. 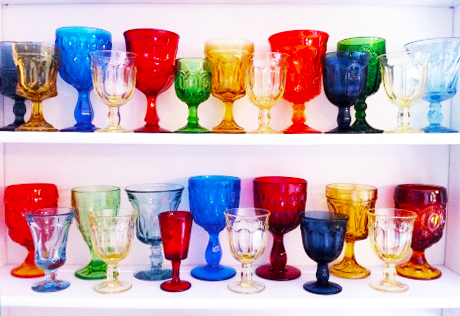 Since then I have accumulated quite a lovely load of gorgeous goblets of all sizes, shapes, and colors. It’s kind of crazy. Where were they all those years? This picture is just a sampling. (I have more in my china cabinet.) And now when we all sit down at the table, I have enough for everyone. Well, depending on the size of the crowd. On our trip to Monroe last week, I found several more at Antique Alley. Actually, it turns out my friend Wendy has a good eye and she spied several for me (like the fantastic orange one on the top shelf). And my friend Heidi surprised me with the six (yes, six!) small yellow goblets you can see along the front. And they all made it back in my suitcases! I love the ridiculous colors and the various shapes. I don’t know why, but they send me! Fun! I love colored glass, but I tend to go more for bottles in my kitchen window. And most of them are just “poor man’s colored glass” — plain glass with water and food dye. And that’s nice because I can make them any color I want. Beautiful! And a fun idea – how the kids must love them! So cheerful! I have begun something similar, finding different colors of blue drinking glasses, then white milk glass. I just love colors especially in winter. Thanks for the inspiration to make our tables fun. Oh, so pretty! Thanks for sharing. The thing I love about mis-matched table settings is that they can be collected over time and added to as families grow and pieces get broken. My mom has collected mismatched rose plates over the years and now has enough for all of us including the growing number of grand kids. Beautiful dishes always make my heart smile. The uniqueness of each is highlighted set one next to the other. How fun. Thanks for sharing a pix. Was that my mother-in-law’s B&B? Because she has those and I’ve started the same collection because of her! I love these sorts of things and I love antique stores, but I guess I have trouble committing to what kind of collection I would like to have so I just don’t have one. Oh but I do have quite a lot of Christmas mugs (but doesn’t everyone?). Yes, indeed, it was your mother-in-law’s B&B. It’s all her fault! Be sure to send her my regards! I LOVE this!! I have a friend who collected mismatched really unique teacups and saucers and I took up the idea and have a few myself for fun tea parties with my girls. They are beautiful. I LOVE coloured glass. I have a set of dark ruby-coloured goblets that look like they came from Narnia, and lots of blue glasses of different sorts, because blue glass is so perfect. Thank you for sharing. What a fun way to be creative! Fantastic–I love these! Anything brightly-colored, mismatched, glass, makes me smile. Hurray for treasure-hunting! What a festive table that must be!